Refraction – refraction is how light moves through a material. When we look at a light source (say, a flashlight from across the room), the light doesn’t appear to bend. That’s because you’re looking at the light through air the entire time. If you’ve left a spoon inside a glass of tea, then the spoon appears to bend when it’s submerged in tea. That’s because the tea, which is mostly water, has a higher refractive index (RI) than air. The difference between the movement of light in air and the movement of light in water is what creates this effect. If you wear glasses, you have refraction to thank for allowing you to see clearly. The lens of the glasses refracts light so that it bends before it enters your eye, making what you’re looking at appear more focused. In diamonds, the RI is very high, so light bends a lot inside the diamond itself. 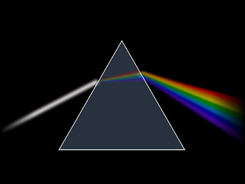 Refraction also causes the “rainbow” effect that we see in diamonds. In materials that have a high RI, light travels more slowly in them, because the material absorbs the light as it moves through it. How slow? In a diamond, light travels more than half its normal speed. So how does this create the rainbow effect? The white light that we normally see (from the Sun, from your bedside lamp, or the fluorescent in your office) is really composed of a bunch of different colors (red, orange, yellow, etc.). Air doesn’t absorb or refract light very well, so we see all the colors as just one color; white. In a diamond though, the different colors are absorbed and re-emitted differently. This difference is what causes the colors to “fan out” in a rainbow pattern, because the material is just refracting them all slightly differently. This effect is known as dispersion. Reflection – So once the light enters the diamond, what happens to it? If the light were to just pass right through the diamond, it wouldn’t have much shine. What needs to happen is for the light to bounce off the inside of the diamond back out towards you to get the maximum effect. The light then has to move across the diamond at just the right angle in order for it to be properly reflected back towards you. When light bounces around the inside of a diamond before coming back out the top (also called “total internal reflection”), it creates the appearance that the diamond is “on fire” with light and is a very desirable quality in a diamond. So why don’t all diamonds sparkle in the same way? How much a diamond sparkles has to do with how to jeweler cut it from a rough stone. Before a diamond is cut, jewelers put the rough diamond into a machine that analyzes the diamond’s structure. The program then tells the jeweler the best way to cut the stone in order to get the best light return. Sometimes though, cutting the stone to these ideal proportions will cause a lot of the diamond to be cut away. As even rough diamonds are expensive, the jeweler might not want to cut away so much of it. What to do in such a case? 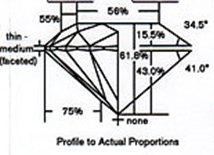 The “ideal cut” of diamond has specific proportions, but the diamond cutter can adjust the proportions as he or she sees fit. Sure, it might not have as much sparkle, but at least the carat weight is preserved. What do all those numbers mean? And what’s going on with those angles? I bet you didn’t expect a trip to a jeweler to turn into a geometry lesson. The average diamond buyer probably doesn’t know what numbers mean what, and the average diamond seller probably doesn’t either. If you can’t decipher all those numbers, then what about the cut grade? Surely an “Excellent” diamond always looks good. But the issue is that not every “Excellent” diamond is going to look the same. Instead, they all fall into a range. Imagine “Excellent” diamonds being an “A” grade, “Very Good” diamonds in the “B” range, etc. An excellent diamond could be either a 90 or a 100 – two very different grades – but they’ll both be graded as excellent. So how to parse out the 100’s from the 90’s? One important thing to look out for is symmetry. If you inspect the diamond under a 10x jeweler’s loupe, you should be able to see a pattern depending on how the diamond was cut. 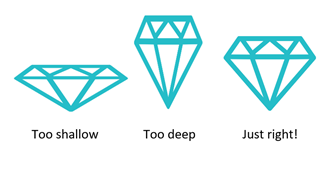 If a facet looks out of place, or one on the arrows on the “hearts and arrows design” looks misaligned, then your diamond isn’t perfectly symmetrical. Ask the jeweler if he or she sees the misalignment as well, and if they have something else to show you at a similar price point. Keep in mind though, that a better diamond almost always means a higher price. A symmetrical diamond will return light in the most optimal way. Ultimately, the light and fire that a diamond has is best assessed by you, not through a scope or by some numbers. If you’ve examined a diamond you like in multiple types of light (fluorescent, natural, incandescent) and from different magnifications, then you’ve done your due diligence. Don’t let anyone dissuade you from a diamond that speaks to you just because the report says the angle is a fraction off from “what it should be”.